1. Preheat the oven to 180°C, gas mark 4. Grease and line two 23cm round cake tins with baking parchment. Separate the eggs and combine the yolks (plus extra yolks), sugar and vanilla bean paste in a large bowl. Use an electric hand whisk to whisk until pale and doubled in volume. Sift over the cocoa powder and fold in. In a clean bowl, whisk the egg whites and salt to stiff peaks then carefully fold into the egg yolk mixture. Divide between the lined tins and bake for 30 minutes. Cool on a wire rack. Cut each cake in half horizontally. 2. For the icing, put the cocoa powder, syrup and salt into a saucepan with 125ml hot water, whisk until smooth then bring to the boil. Reduce the heat to a simmer and cook for 2 minutes, whisking constantly, until smooth and glossy. Remove from the heat and whisk in the chocolate and butter until smooth. Set aside to cool. 3. Drain the cherries, reserving the syrup, and set aside. Pour the syrup into a saucepan, bring to the boil and reduce by two thirds. Remove from the heat and stir in the kirsch. 4. Whip the cream, icing sugar and vanilla to soft peaks then fold in the drained cherries. Then assemble, put a small spoonful of cream onto a serving plate or cake stand and lay a sponge on top. Spoon over a quarter of the kirsch syrup, spread over a thin layer of the chocolate icing and top with a third of the cream. Repeat this layer with the next two sponges. Top with the final sponge, soak with the remaining syrup and spread over the remaining icing. 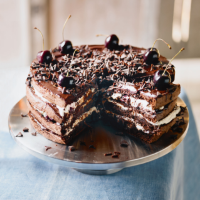 Top with the fresh cherries and chocolate curls. Chill for 1 hour before serving.